Yesterday, a friend of mine named Taylor passed the sacrament for the first time. He was baptized into the church six months ago, and was ordained to the priesthood two weeks ago. As the sacrament coordinator for the ward, I’m in charge of supervising the preparation and administering of the sacrament. Last week, I felt prompted to ask Taylor to help with the ordinance, and so I did. 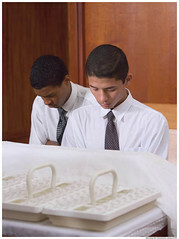 Watching him reverently act on behalf of the Savior was an honor. 3. Every convert must be ‘nourished by the good word of God’ (Moroni 6:4). I can’t count the number of times I’ve seen people baptized into the church, only to never receive a calling or be given a responsibility. I can’t count the number of times recent converts were neglected when it comes to home teaching. I can’t count the number of times that recent converts have sat alone in meetings. And much of the time, I’m ashamed to admit, I’ve just sat back, watched, and criticized, rather than take responsibility for my complicity in our failure to retain those we bring to Christ. The truth is, I shouldn’t have needed to wait until I was prompted to invite Taylor to help. It should have been my first thought, the moment he was baptized and the moment he was ordained. It should have been a reflex. Never again. No one is going to slip through the cracks on my watch anymore, if I can help it. It is wonderful that you have a way to invite all the male converts to participate without fanfare, and without regulating them to some quietly ignored calling. Congratulations for recognizing it. Another thing we need to do with new converts is to get them to the temple for baptisms within 90 days. about 15 years ago, I saw church statistics on this. Activity rate for converts who did not go to the temple after 2 years of membership: 30%. Activity rate after two years for those who did go to the temple within 90 days: 75%. It truly changes a testimony into a conversion.